I was lucky enough to score an interview with one of the table tennis greats of Europe, Jorg Rosskopf a.k.a Rossi. I always felt Rosskopf was a player who had great success but lived in the shadow of players like Persson and Waldner and got less recognition for his achievements. Retiring in 2010 he became the National Coach of Germany and has continued his great success in that role. Thanks for the interview Rossi! How long did you play table tennis for, when and how did you start? I started when I was 5 years old and played until I was 40. 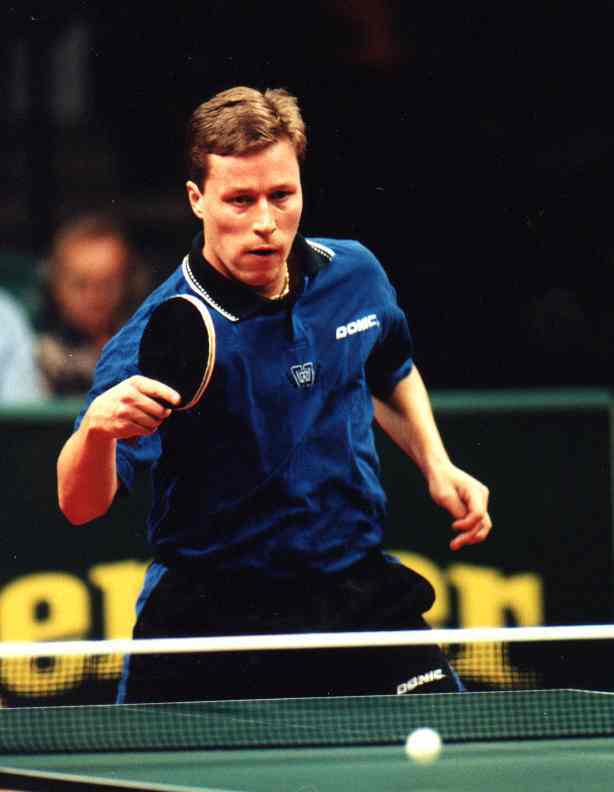 What was the highlight/best memory of your table tennis career?Winning the 1989 WTTC gold medal in mens doubles with Steffen Fetzner and winning Olympic medals in both 1992 and 1996. You played in an era with some of the most reputable and respected players of all time (yourself included). Who was the player you enjoyed playing the most? The best player ever is Jan-Ove Waldner and he was the most difficult to play against. How does it feel to have the opportunity to go from being Germany's leading player of the time to now having the opportunity to be their national coach? It is a big pleasure to work with such a strong team and I hope I can improve them a little bit more. How do you think Germany will perform at the WTTC team event in 2012? Do they have the potential to equal or better their previous silver medal result? The young French players have been making a big impression on the World Tour lately with some big wins. Patrick Franziska also shocked followers with wins over Persson, Tokic and Chuang Chih-Yuan at the recent Qatar Open, do you think Patrick will be the next prospect for the top German player? He have the power but it is very difficult to say what he will acieve in the future, but he has the chance and a good background to became a good player. What does Germany (and Europe) need to change in the way of training in order to compete with the Chinese National Team? 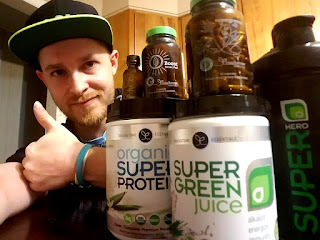 They have to work more and spend more time training and less time with breaks. Do you think the change in your era from the 38mm ball and games to 21 to the 40mm ball and games to 11 improved the sport of table tennis? The ball has no affect, but to change to 11 was a good idea because now there is more and earlier tension in the game. 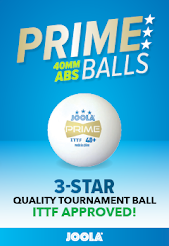 Have you or the Germany National players had the opportunity to try the new material table tennis ball prototype expected to be released after the Olympics? If so, how do you think that will change the game? Which European players do you think will pose a threat to the Chinese at the Olympic Games? Perhaps Ovtcharov, Skachkov etc? Now Boll and Ovtcharov from Germany, Mizutani from Japan and Joo Se Hyuk from Korea and in the future Ovtcharov, Baum and some french players I think also. What would you like to achieve as German National Coach while you are in that position? I.e your biggest goal. To win against China in a final. What is your opinion on the careers of Ma Lin and Wang Liqin? Do you think they will be in the Chinese National Team much longer? No, I think after London Olympics they will stop and the Chinese will push the new generation of players. First thing you would do if you won $1million? Who trained the hardest in the training hall? Who’s was the funniest team player? Who had the best nickname? Want to read more great interviews with other former World Champions, Cup Winners and Number 1's? Click for MORE INTERVIEWS. 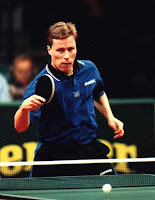 Nobody has ever doubted that Waldner is one of, if not THE, greatest player/s of all time. Recently however a rapidly growing support for Ma Long has arisen. Having recently equalled Wang Liqin's record for the greatest number of successive Pro Tour tournament wins, Ma Long has got the world on their feet. Despite his team mate Zhang Jike winning both the World Championships and the World Cup, the fans still sway in Ma Long's favour. So the real question is, is Ma Long a greater player than Jan-Ove Waldner? For arguments sake Waldner's history of event's won is much more significant and Ma Long's most major event is the Pro Tour Grand Finals, he hasn't even won a major World event. He does of course have a high probability of an Olympic medal these coming Olympic Games should he be selected. So despite Waldner's reputation as 'the world's greatest ever' does Ma Long have the potential to claim that title? Waldner's precision and showcase touch around the table inspired generations of players in Europe and around the world. Unique style of play and a talent for spin and ball control. Ma Long captures the essence of speed and power in the game and demonstrates overwhelming dominance in open rallies and ability to attack early in the bounce. So the players although well rounded players, both exhibit some opposites, which makes the debate all the more interesting. Either way I don't think a conclusion will be reached anytime in the near future, though the discussions will be long and fierce between opposing fans. For both groups I've made a video showcasing the genius play of both players side by side!